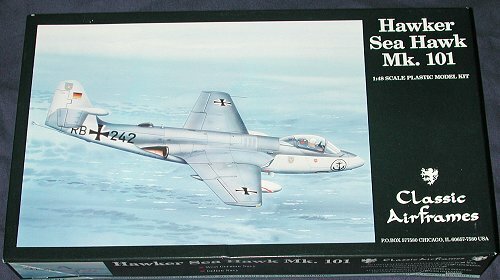 Based on the Hawker P.1040 prototype, the Sea Hawk had development begin in 1944, and 17 years later, was still in service. The aircraft was developed around the Rolls-Royce B.41 jet engine and was to have bifurcated inlet and exhaust ducts, leaving the nose clear for weapons. This early in the development of turbojets, much research was going into proper inlet/exhaust operation and lengths. In those days, too long an inlet would result in the loss of power so a happy medium needed to be sought between ideal engine placement and inlet design. By late 1945, the General Staff didn't see the P.1040 as being much of an improvement over the Gloster Meteor IV, but the Navy was interested and so Specification N.7/46 was drawn up to cover the three prototypes. The first prototype, VP 401, first flew in September 1947 and was generally an acceptable aircraft. This aircraft was followed by a navalized aircraft, VP 413, the first Sea Hawk prototype. The wingspan was increased by 30 inches to lower stall speed and the aircrafts speed of around 500 mph was considered to be quite good for a naval fighter. Deck trials aboard the HMS Illustrious concluded in late 1949 and gunnery and other trials commenced early in 1950. By this time 151 aircraft had been ordered, the only real change was the addition of an 'acorn' fairing at the leading edge of the tailplane/fin join to help smooth out airflow over the tail surfaces. By 1953, the first operational squadron (806) received Mk.I aircraft and embarked upon the HMS Eagle later that year. Other squadrons were to follow. It was decided that Hawker was unable to meet the demand for aircraft so production was switched to Armstrong-Whitworth, who did all further development on the aircraft. In 1956, after the production lines had been dismantled, the West German Navy placed orders for 64 aircraft. Half of them were Mk.100 day fighters, and the others were to be Mk.101 all-weather fighters with search radar carried in an outsized wing pod. The distinguishing feature was to be a taller fin/rudder. In 1959, the Indian Navy signed an order for 24 Sea Hawks, half newly-built and the others ex-RN FGA.6s. Ultimately, 74 aircraft were delivered to serve aboard the INS Vikrant. These were mostly the shorter fin aircraft, though a couple of dozen from Germany were the Mk.100 and Mk.101s with the taller fin. The Sea Hawk Mk. 100/101 was unable to participate in the first India/Pakistan war of 1965 thanks to an embargo, but was able to partake in the Second War with Pakistan in 1971. These Sea Hawks were eventually replaced in the early 1980s with the Sea Harrier. I'm going to be, like, super-lazy and just repeat what I said about the RN boxing. The ONLY difference between these two kits is that the Mk.101 has a different rear fuselage section that includes the taller fin. Opening the box, one is presented with two large and one small plastic sprue. There is also a one-piece canopy that is injected and crystal clear. A bag of resin goodies and a fret of Eduard etched metal are also in there. Two large decal sheets and a set of instructions concludes the 'bits in the box. The forward portion of the airframe is split horizontally, while the aft section is split vertically. 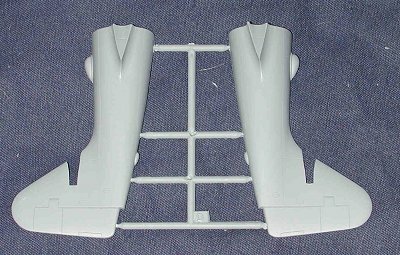 Most of the major airframe and landing gear parts are in plastic, which is superbly molded with nicely engraved detail. A few ejector stubs to clear up, but no sink areas and no flash. The outer wings are separate, and it is obvious by the resin and metal bits that this model can be built with the wings folded. The etched bits include the outer wing fold rib, instrument panel, seat harness, and intake splitter plates among the biggies. Resin covers the main wheel wells, seat, various control boxes, wheels, exhaust, inner wing ribs, and the intakes. The resin is superbly cast with none of my parts exhibiting any readily apparent glitches. There is also a small acetate sheet for the instrument. Instructions are excellent, providing detailed construction steps as well as providing any color information needed. There are several hints and helpful suggestions, which would be advisable to read and are a real help for those not totally used to multi-media kits. Nose weight is required to keep this one from tail sitting and there is lots of room for it behind the cockpit. There are two options; one for folding wings and the other for carrying the drop tanks and/or bomb racks. No bombs are provided, but finding some shouldn't be too big a problem. 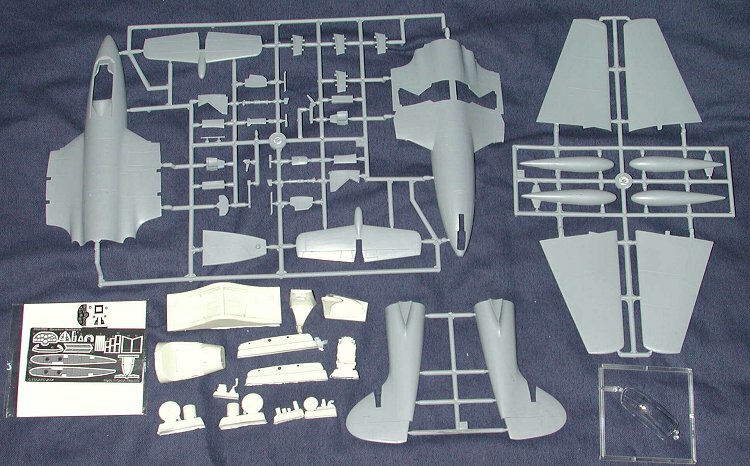 It would have been nice to have rockets and rocket rails as well, but you can steal those from an Airfix late model Spitfire if you must have them. 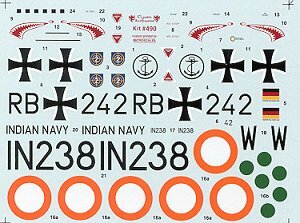 Decals are provided for two aircraft. First up is from 300 Sq of the Indian Navy in Extra Dark Sea Grey over Sky. The other is from MFG 2, and it is in Extra Dark Sea Grey over White. In reality, most Sea Hawks with India and Germany were in the EDSG and White scheme, though I've seen profiles of both the kit's aircraft with the Sky undersides (Warpaint # 29) so you have a choice. The decals are superbly printed by Microscale so you know you are getting the best. I'm sure that this version of the Sea Hawk will be as warmly received as the Royal Navy version. It gives the builder something a bit different to put on the tables before his friends. As with the other kit, some experience is helpful when it comes to building this kit, but I think that it would also be a great first large scale multi-media kit for those who want to see what all the fuss is about!